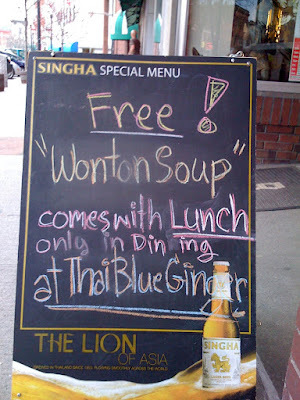 The “Blog” of “Unnecessary” Quotation Marks: "wonton soup"
mmmm, fake foods. Those are the yummiest. I wonder what's really in the soup? Thanks, Ethan. It's obvious that this sign used to say "dinning". I wonder if someone from the restaurant fixed it, or if the correction was done by a concerned passer-by. I've eaten at that restaurant. Wish I'd known it was "food" instead of food at the time. Hi Could I know which country this sign is from? Sharon: the US. Well, I suppose it could have originated somewhere eles, but the photo was taken in Greenfield, MA. Obviously, they meant "wanton" (or "lustful") instead of "wonton".